Registered users have the ability of saving arrangements and load them in future games (and of course alter them as desired). Loading and saving arrangements is possible for Classic, Barrage and Ultimate Lightning. 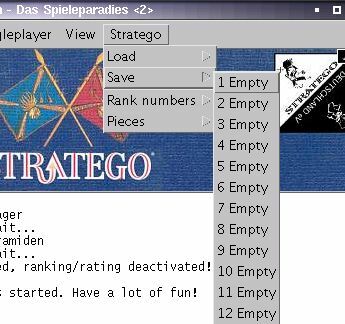 Both can be done in the menu "Stratego" of the main window. When two players have joined and started a game, both can setup their pieces. If one clicks on one of the save slots, one will be asked for a short name and then his arrangement will be saved under this name. In future games one will be able to load the arrangement again and of course alter it as desired.